Puma have had a wild ride since launching the Puma v1.11 this summer, swooping in for the likes of Thierry Henry, Steven Pienaar and Matthew Etherington whilst top stars like Sergio Aguero, Carlos Tevez and Joey Barton have all been spotted trying out blacked-out versions of their football boots. Now, in what seems like a subtle nod to the black-out versions of the Puma v1.11 we’ve seen Tevez, Aguero and Loic Remy wearing in training sessions, Puma have elected that the new version of their latest football boots is a stunning combination of Black/White/Blazing Yellow. First things first, this colourway is – as far as Puma football can confirm – exclusive to the synthetic Puma v1.11. This not only means that we won’t see a leather version of these black beauties (boo! ), we won’t see them on the ultra-light SL version either, a very interesting move by Puma. 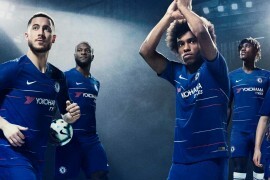 With that said, it only goes to underline the synthetic Puma v1.11‘s popularity at the moment; whereas the most popular versions of rival adidas’ F50 football boots are the leather and super-light ‘Prime’ model, Puma’s speed boots really buck the trend with professionals opting for the ‘standard’ synthetic. 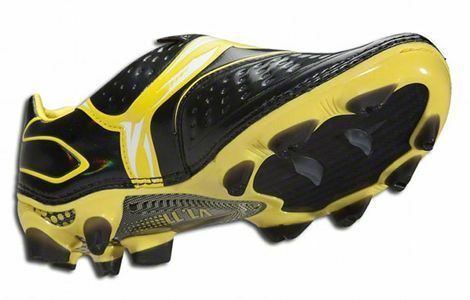 The black synthetic on the Puma v1.11 – Black/White/Blazing Yellow really looks the business on this model. Rather than being entirely dark, Puma have opted to add a ‘3M’ style holographic sheen to the upper, which not only looks top-notch up-close, it also reminds us of shiny football stickers – which, as we all know, were the best. 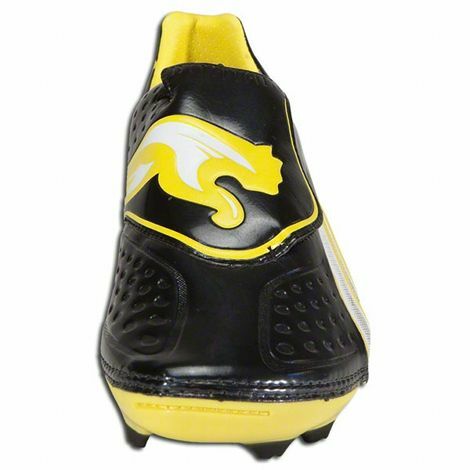 Contrastingly, the white and yellow Puma branding across the instep and outstep pop off the boot unapologetically, which is sure to get the classic Puma Big Cat and Formstripe noticed when these football boots hit the pitch this month. We’ve been a bit sceptical of the Puma v1.11, since their launch. As well as being the first ‘yearly’ update of Puma’s speed football boots silo (which has traditionally launched once every two years since the v1.06), the new lacecover and design often looks far from elegant in the ‘Fluo Green’ launch colourway. But seeing it in this colourway really wins us over, with the huge Big Cat graphic wrapping from the instep to the ‘throat’ of the boot a particular favourite piece of design. We know that Puma don’t really like to build the hype around new colourways, and the Puma v1.11 – Black/White/Blazing Yellow is no exception! If you’re after a new pair of cleats, you can order these from 1st September 2011. Of course, what really matters is what you think! 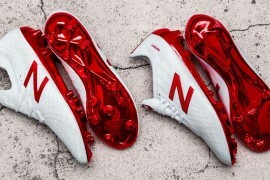 So why not tell us what you think of Puma’s latest football boots in the comments, or using the patented boot-o-meter?